This is a timely issue as the world commemorates the 60th anniversary of the liberation of Auschwitz. This is a work I found both beautiful and dignified, and, though the word may seem inappropriate, exciting, for it is extremely powerful with a momentum that is evident right from the start. 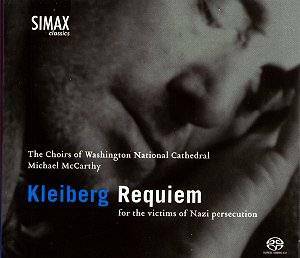 Norwegian composer Stale Kleiberg has succeeded in writing a piece that is a fitting tribute to the victims of the Holocaust; a piece that holds its head up high, without any over-sentimentalising of events which were so unspeakable they need nothing but a truthful telling. To the final solution was a small step. We entered by the gate of fear. We exited without hope, as smoke. Powerful, direct and brutal in the graphic stories they tell, the words of the poems are cradled by some equally powerful music. The second movement, Dies Irae, reminded me very much of Orff�s "Carmina Burana" inasmuch as it is earthy and musically very strong. All the music is extremely effective in putting over the horror and poignancy of the events and is well played and sung by a clearly devoted band and choirs. This is a work that deserves to be heard and it would be wonderful if it were programmed into this the 2005 Proms season. I thoroughly and unreservedly recommend that you listen to it.